The center for the advising and support for St Mary's undergraduate students. 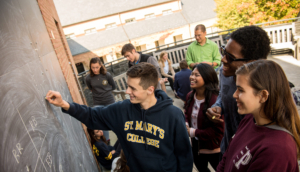 The St. Mary’s academic advising program is committed to being a student-centered, integral part of the entire educational experience for our students at an honors college. Advising is an on-going and multi-faceted process that focuses on the development needs of the student. While the advisor serves as a facilitator for communication and planning related to academic progress, it is the student who bears ultimate responsibility for monitoring progress towards graduation. Discover what accommodations St. Mary's makes for students with disabilities.